Shepherding in the church is tending to the welfare of Christ-followers by watching over, nurturing, and guiding them. Having assessed the condition of the flock, shepherds will do what is needful to lead them to a greater Christ-likeness. To what or to whom is shepherding ministry to lead people? Those involved in the shepherding ministry of the church are more like "under-shepherds." The sheep are not ours. They belong to the Lord. We need to remember that it is about Him, not us. He is the Chief Shepherd (1 Pet. 5:4) who is good (Jn. 10:11) and great (Heb. 13:20) and the guardian of our souls (Heb. 13:20-21). We are vessels through whom He works. We simply provide the conditions conducive to growth and productivity. The Lord is the One who causes the believer to grow (1 Cor. 3:7) and to bear fruit (Jn. 15:4-5). Shepherding Ministry is not about getting people to follow us but rather to follow Him. Shepherding ministry must lead people to the Chief Shepherd and His power and provision. If it does not, it is unhealthy and will tend to produce dependent or crippled sheep rather than whole and productive sheep. The Shepherding Ministry Manual includes this content and also guides you in a study of the three different words used in Scripture to describe this Shepherd -- the Good Shepherd, the Great Shepherd, and the Chief Shepherd. What are the Benefits of a Shepherding Ministry? When shepherding is intentional, regular, and consistent . . .
Sheep are most productive when they are properly tended to (nutrition, protection, shelter, water) and cared for (affection) by the shepherd. The ultimate goal is that sheep produce wool, offspring, or good meat. So, the objective for the church is to help people become more Christ-like and bear fruit. This happens best through a shepherding ministry. Who can or should be involved in a church's Shepherding ministry? Why is shepherding best facilitated through a network of shepherds in the Church? 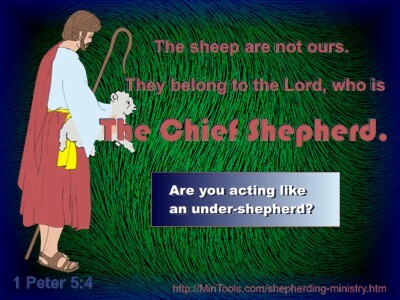 What is a shepherd's general ministry description? Why is it important for a shepherd to determine the condition of the flock? How does Discipleship fit within shepherding ministry? How are Elders to shepherd the flock? How does Equipping relate to shepherding? How is Mentoring a means of shepherding? How can Ministry Teams be shepherded? How are Parents to shepherd their children? How are Pastors to shepherd the flock? How can Small Groups be used as a shepherding venue? How can Sunday School Teachers shepherd their students? How can Support Groups involve shepherding? Where can I find resources for shepherding ministry?